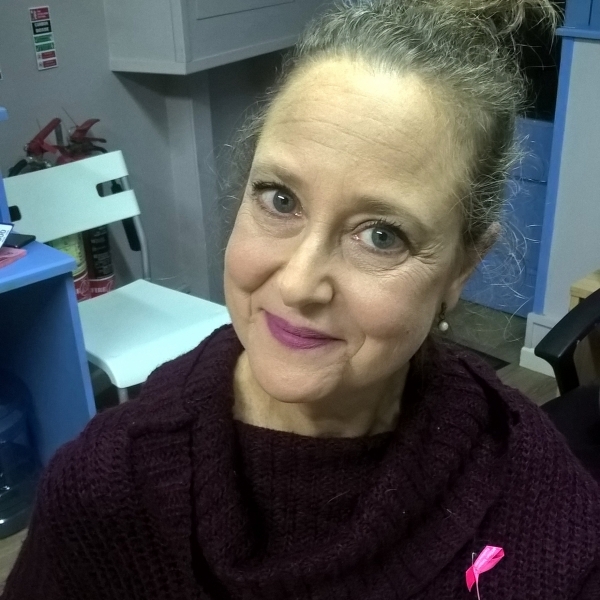 Apparently, you don’t need to be a writer to write a blog, which is just as well because I’m not a writer; I’m a Pilates Teacher (and a Pilates Studio owner). This is where I'll try to add another layer of understanding of what we do, how we do it and at times some shorter items of random thoughts and/or reflections. Reform. Inform. Transform. 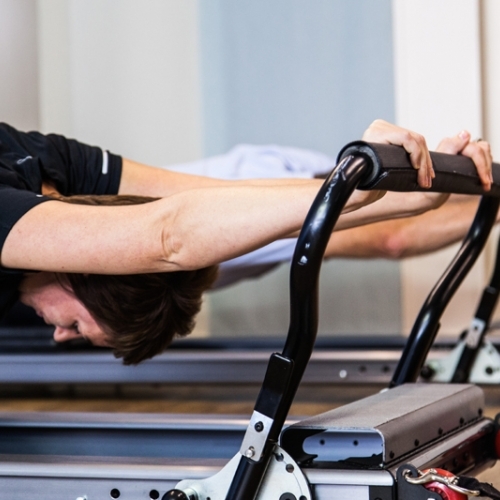 – How the different parts of the Reformer help you find your body. Pilates Reformers are one of the main reasons I’ve decided to open Pilates Studio Kildare. I wanted to bring in Reformers and I could not schlep those around like mats and small props (no matter how big my then Passat boot was). Yes, you can do Pilates without the machines Joseph Pilates had invented and build - of course you can. I’ve been teaching Pilates for 6 years since moving to Kildare without “machines” but I missed them. Joseph Pilates invent and build an amazing array of spring resistance based apparatus to accompany his Method. Each apparatus was designed to help accelerate the process of stretching, strengthening, body alignment and increased core strength. 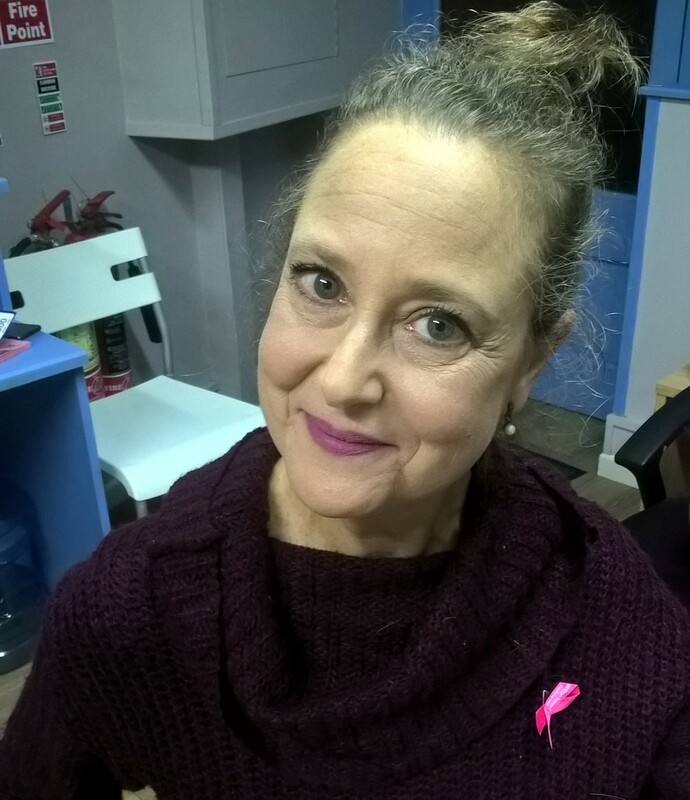 I wanted to bring that whole new level of Pilates practice, learning and understanding to my clients. Isn’t that what we really need? What we want? “Find the time to exercise!” or “Make the time to exercise!” “Those who don’t find time to exercises will have to find time for illness” or actually a funny one that says “’I don’t have the time’ is the grown-up version of ‘the dog ate my homework’” – isn’t a more positive, calming, idea that the time you move on a Pilates machine is efficient - so much nicer?!? It’s not just “nicer” – it is true. Research had found that moving with an external load/weight can make movement practice more efficient as the mechanical forces encourages the neuromuscular system to adjust quicker. Research also found that the same mechanical forces have an effect on the musculoskeletal system, bones strength and over all health. Pilates understood that the resistance provide improved proprioception and that springs are ideal external load as you can increase or decrease the load according to your body and ability. In a way, what Pilates is saying is that his spring-based resistance apparatus can act like a teacher – and there’s no doubt that the Reformer (originally called the Universal Reformer) is the centre-piece and well known then all the other equipment Pilates had invented. 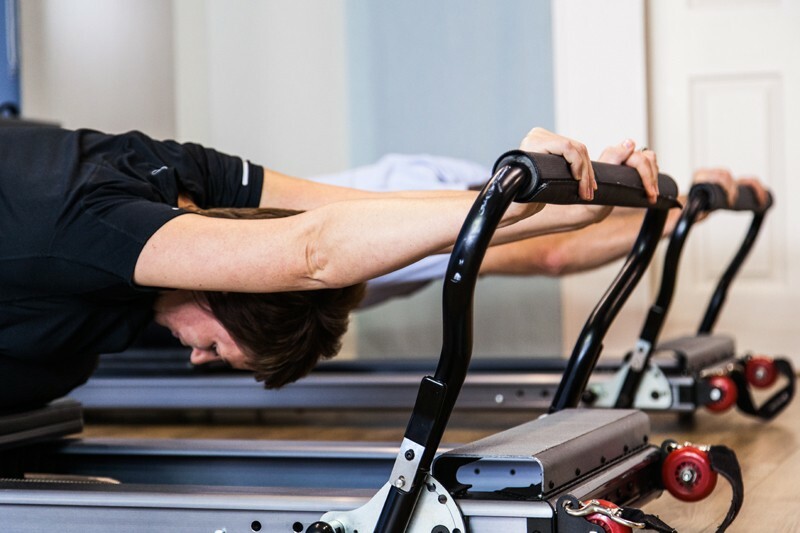 So, the Reformer acts like a teacher – the tactile physical feedback you get from interacting with the Reformer teaches you, explains to your body how to control, how to fire-up and get the right muscle activation. as you push/pull and interact with the springs forces. When you move on, and with, the Reformer, you can feel how the machine sort of nudge you to keep a certain position - like a Pilates instructor that helps you find the right form, helps you achieve a movement by holding a leg or an arm so you can explore your balance, stability, mobility, the Reformer does exactly that, and more… It will very much alert you and make you focus on what you’re doing and how you’re moving. 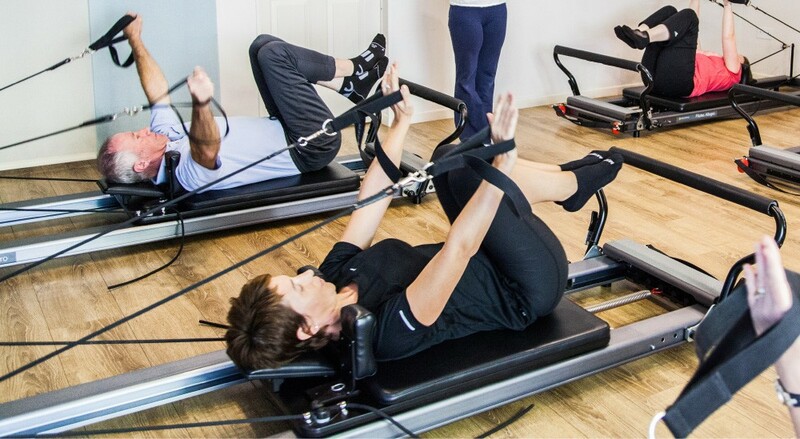 I remember one of my clients commenting that if her mind wonders during class the “BANG” from the Reformer (carriage banging in the frame) brings her right back into the class and makes her concentrate. 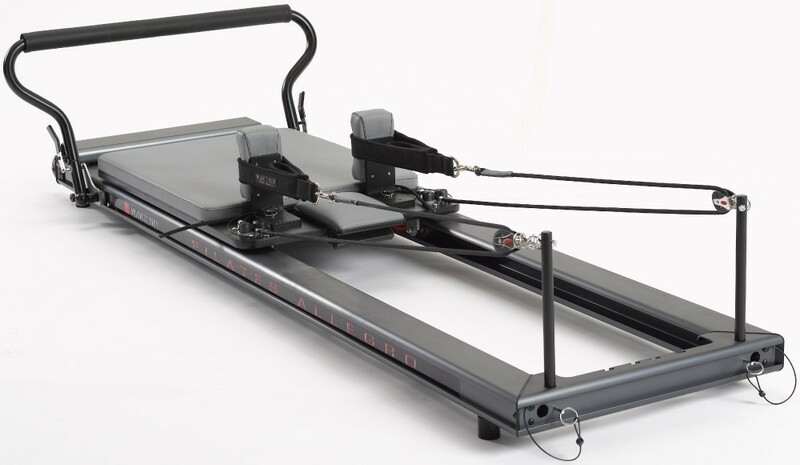 This simple machine is amply named “Reformer” as it informs you, reforms & transforms your body – but how does it do it? What is a Reformer and how does it work? The Reformer is a bed like apparatus with a long frame and flat platform (carriage), which acts like a moving mat sliding back and forth along the big frame. 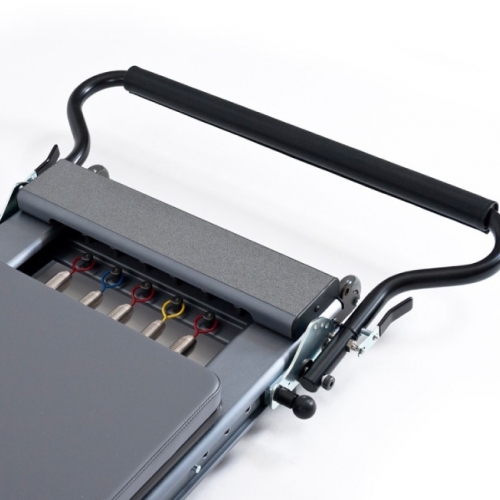 The carriage is connected to the frame with springs that provide resistance as the carriage is pushed or pulled along the frame. Here’s a run down of the different parts of the Reformer and how they help achieve that effectiveness. How each part finely-tuned to allow that very precise work: alignment, control strength and flexibility. The carriage that is a padded mat that you put your body on. 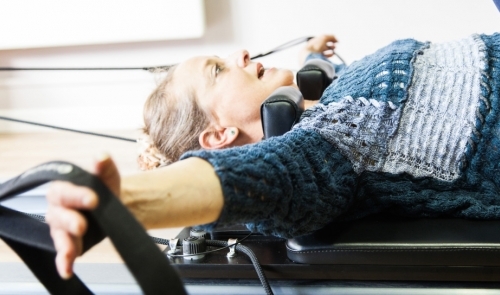 Reformer exercises can be done lying down, sitting, kneeling or standing on the carriage. The carriage features the ‘Head-Rest’ and the ‘Shoulder Rests’. The ‘Head-Rest’ provides head and neck support between the ‘Shoulder Rests’ blocks that offer stability and comfort. As you’re lying down the Headrest height can be adjusted. With your shoulders under the Shoulder-Rests this is a constant reminder for you to keep your head in the centre and your shoulders down from your ears. 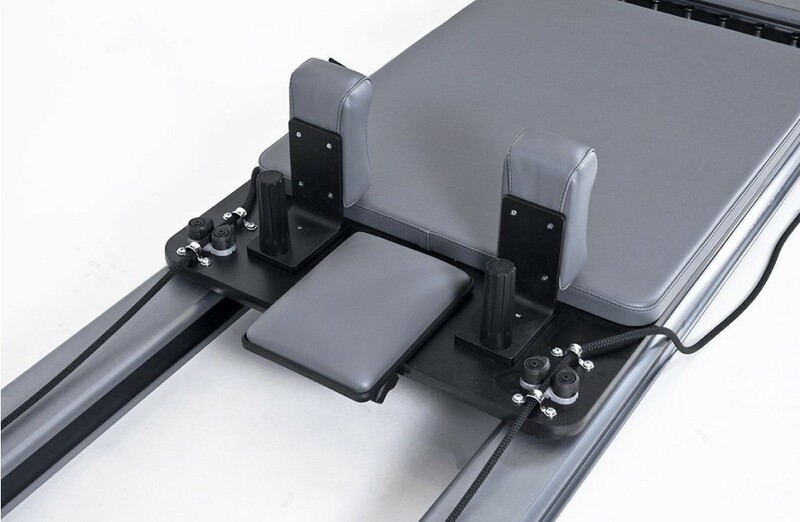 (Yes, those shoulder rest also make sure you stay put on your Reformer and not flying off from the forces of the springs - quite important to prevent you launching like a torpedo into the back wall of the studio I would say.). The ‘Footbar’ at the end of the frame is where you initiate the push of your carriage (your “movable mat”) to glide along the frame and it’s the pushing the Footbar against the springs that initiates the resistance at the start on exercises (keep reading to learn more about that). Please don’t let the name “Foot-Bar” give the wrong impression – you can push on the bar with your hands too, which, of course, we do! Also, you should note that the Footbar adjusts to different body sizes and ranges of movements available for each body. 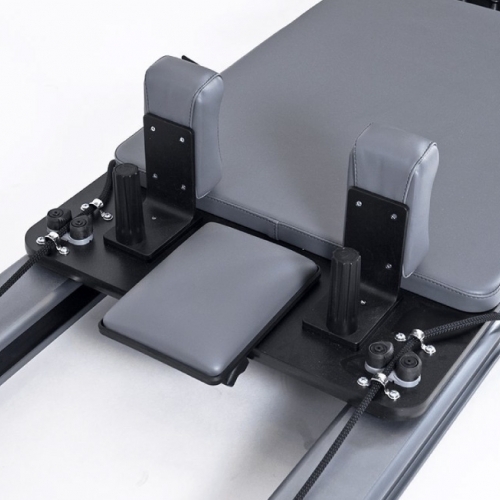 The Footbar on our Allegro® Reformers move both vertically (for height changes) and horizontally - nearer or farther away along the frame. The 'Springs' provide resistance for each exercise and are colour-coded to indicate resistance level. Attaching or detaching the springs at the spring-bar (a series of hooks and/or bolts) changes how much resistance is created when the carriage moves. Please pay close attention to the directions you are given during class about what springs to attach and which springs to detach. 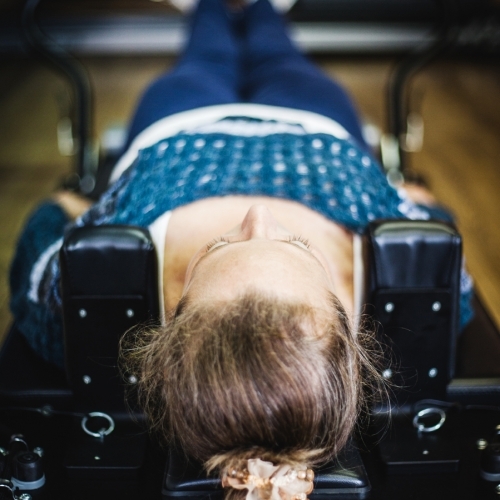 I’m going to take a pause here from describing the different Reformer parts because I want to talk a bit about the combination of Footbar, Shoulders-Rests and Springs as you’re lying down supine (on your back) on the Reformer. 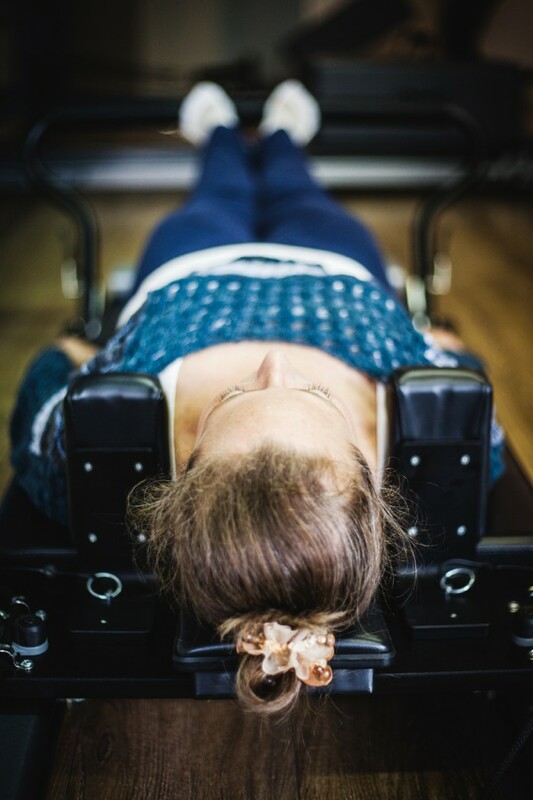 The first thing you are probably going to do on the Reformer is lying down with your head resting on the Head-Rest, shoulders aligned and rested just below the Shoulder-Rests, your back lying on the carriages’ mat and your feet on the Footbar. The first movement, or series of exercises on the Reformer you will probably do what is called “Foot-work” or “Leg-work” which will have you push your feet into the footbar, straighten your knees (legs) against the springs resistance and then came back with your carriage closing the springs. As your legs are attached to the bar pushing against the spring resistance at one end, the shoulder rests will stop your body from moving with that direction at the other end (you’ll be flying off the Reformer otherwise) and so your entire body is now being affected by the force of the springs and that weight, that force, in closed circle (feet to shoulders) makes your body react. In essence, it’s like putting weight on your shoulders while you are standing – gravity pulls on you just like the springs when you’re lying down and pushing against the force of the springs. Unlike when you’re standing, the carriage supports you (gravity is in favour of you lying on your back), and your shoulders, neck and head are in their proper alignment and supported. You are now carrying weight (more, less, or equivalent to your own body weight as the case may be) in good form! You’re not bending, your head-neck-shoulders are aligned (your head doesn’t bend, your shoulders are not raised), and with a bit of guidance you’re also pushing with the two legs equally - balancing the forces left and right. Your body responds to the force in the best possible form available to it at this point in time. And that force is trying to compress you. That compressing force makes the body react in the exact opposite way – it’ll work against that crushing force! It’s sort of like when someone tries to push you and you stand your ground. The force of the spring want to compress you, and your body will automatically respond to lengthen! And there you have it: LENGTH AND STRENGTH one of the key components of Pilates (along with Control, Movement-Flow etc. and lets not ever forget BREATHING – but all this is for other posts). The ‘Ropes’ which I love calling “Pulleys” (cause you ‘pull’ on them) are attached to the carriage next to the Headrest. Loops at the end of rope will connect your body (hands or feet) to the carriage so that you can move the carriage pulling on them. Like the Footbar, pulling on the ropes will initiate the resistance from the springs but unlike the ‘stable fixed to one place’ bar, your body now have to learn, deal-with and control the trajectory of the pull… I admit it’s hard to explain in words how this works and what it feels like …at the end of the day, like the entire Pilates Method of Body Conditioning, you have to experience it in your body to understand it. 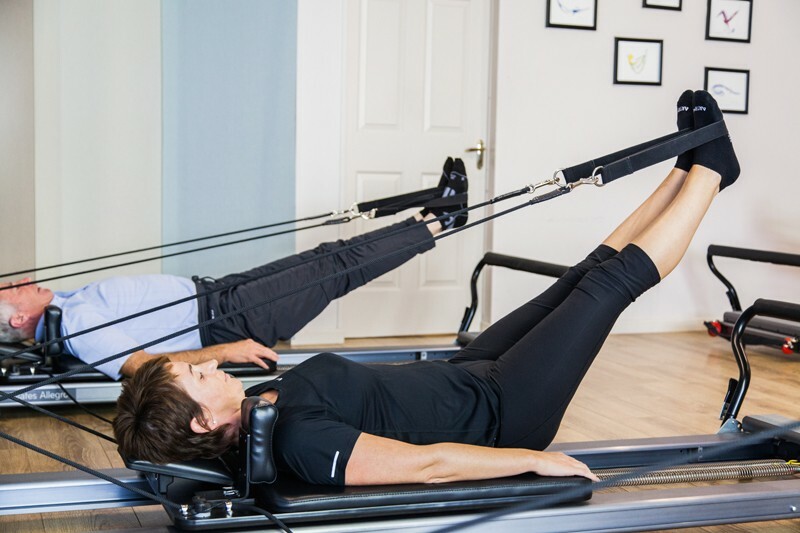 The ‘Foot-Strap’ is a great accessory that is attached at the end of the Reformer frame, which is used in combination of another great piece of Reformer addition, The ‘Sitting Box’. 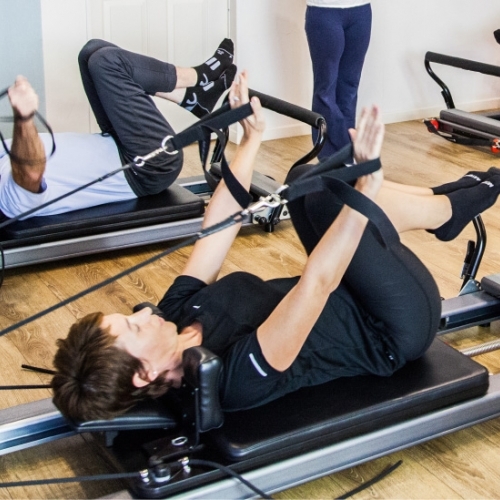 The Sitting Box is placed on the carriage (either on it’s long side = “Long Box” or short side “Short Box”) for a whole array of Pilates exercises and movements on the Reformer. Like the name suggest, exercises can be done seated but it’s also being used lying down on your front (prone) or on your back (supine) pushing on the bar or pulling on the ropes. But don’t forget that Foot-Strap – you might just find yourself completely dependant on it despite that fact you’re “seated” on a sitting box. If you’d like to see how the sitting box and strap work together – here’s a video of the first exercise of what is called the Short-Box Series called “Round Back”. The last part of the Reformer I’m going to mention is The ‘Standing Platform’ which is under the Foot-Bar at the end of the Reformer frame. 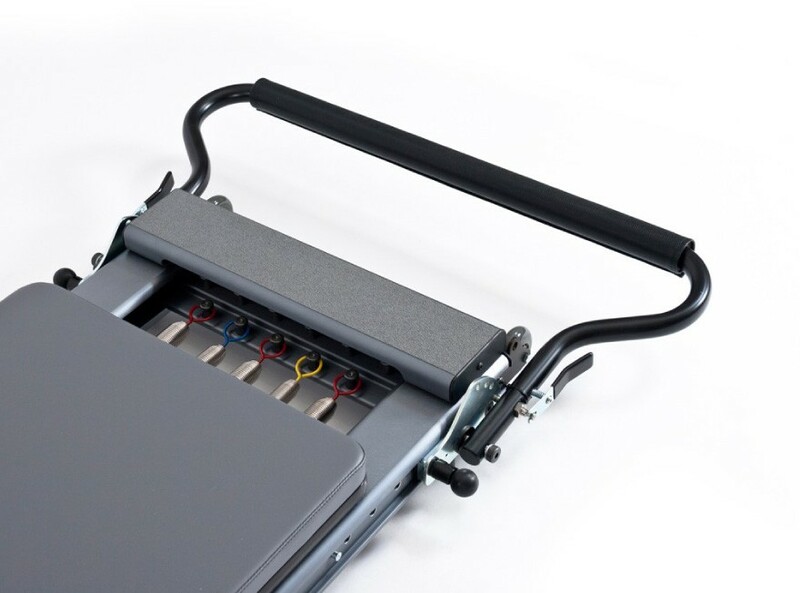 The Standing platform has a non-skid surface so your foot doesn’t slip. Standing with one foot on the platform while another foot (leg) moves the carriage back and forth is the main type of exercises this part is used for, but then again, versatility is the name of the game so placing hands on the platform (We’re nice, we place a soft towel on that rough surface for you) is very much a possibility. So, there you have it. The amazing Pilates Reformer that can change the way you use your body and move. The Reformer promotes length, strength, flexibility, control, balance and coordination, which lead to improvement in posture, efficiency in movement and a more balanced body. You get your full body range of movement whilst training the body to sustain length and stability in your daily life. The best way to learn practice on the Pilates Reformer would be through Private Sessions but if you’re healthy with no special issues or injuries check out our small Reformer Group Classes. See you on the Reformer. Don't miss out on our News and Updates! Subscribe to our Mailing List.
" The acquirement and enjoyment of physical well-being, mental calm and spiritual peace are priceless to their possessors, if there be any such so fortunate living among us today. However, it is the ideal to strive for."